The Kanger Protank has become a favorite of many vapers including me. The solid build, great flavor, glass tank and ease of use and rebuild have made it a fixture in my everyday lineup. 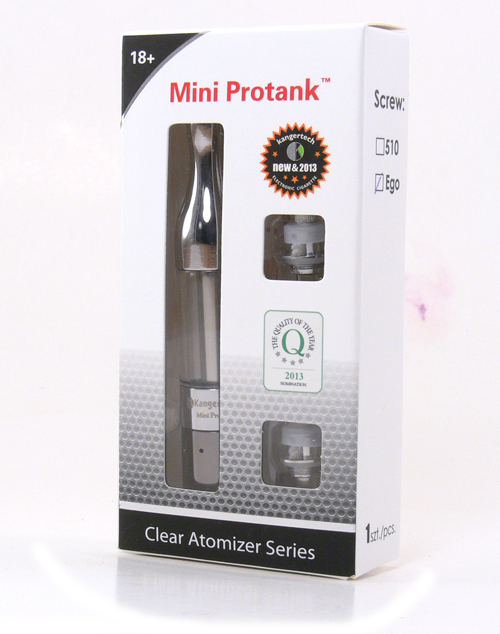 The Mini Protank promises to be more of the same in a slightly smaller package. I recently received a Mini Protank from Viper Vape and immediately put it into rotation. The shape and function are nearly identical to its larger sibling, with the exception of its slimmer width. Of course, that also translates into a smaller capacity, with the 1.2ml Mini holding just about half of what the larger Protank does. 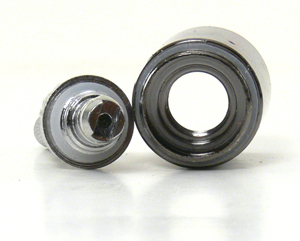 The base on the initial version of the Mini Protank is an eGo style connector with only the outside threads, so it will not work with a standard 510 connector without an eGo adapter. The result is that it looks great on an eGo battery and works perfectly on other ego threaded devices, including the Vamo. This is good news, as Kanger products such as the EVOD are a little too wide and have airflow problems when mated with some devices. 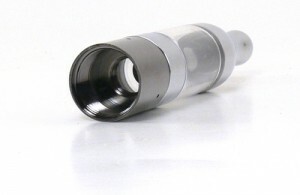 A 510 fitting for the Mini should be shipping soon. 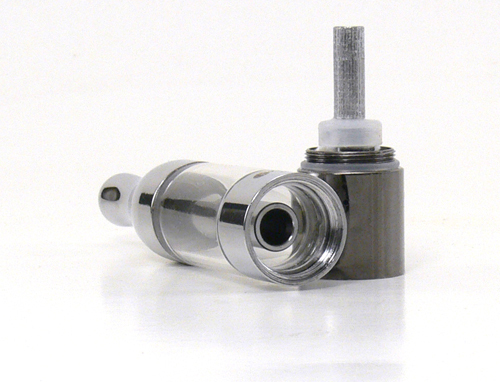 Like other bottom coil changeable (BCC) designs, the Mini incorporates a removable coil head that unscrews easily from the inside of the base. Coil heads are much less expensive than buying the whole unit, so replacing them when flavor starts to wane is not a big issue. I have routinely gotten several weeks out of a Protank head and there is no reason to expect less from the Mini. The Mini comes with two coil heads. The base is my only point of criticism on the design. 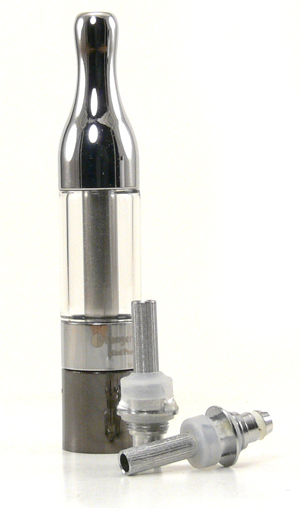 Like it’s larger sibling, the ends of the Mini tank are capped in bright chrome. For some reason, Kanger decided to use a gunmetal finish for the eGo bottom cap. I’d rather see all chrome or all gun metal on my devices, not a mixture of both. It’s only an aesthetic point, but it bugs me. 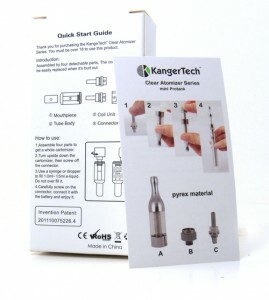 I do have to give Kanger kudos for at least attempting to include instructions. There are not only instructions on the back of the bbox, but on a card inside as well. That’s good info for a new user. Of course, the translated English is not that great, but the real head scratcher is in seeing Kangertech spelled wrong on the outside! The bottom cap unscrews easily to allow for filling. The slimmer tank does mean that there is a little less room between the center tube and the side of the tank, but I still had no issues with filling from a dropper bottle while keeping the tank at a slight angle. Like most bottom coil designs, there is often a little leakage of remaining e-liquid from the mouthpiece, so filling on a paper towel is recommended. The Mini Protank lives up to the what we have come to expect from its BCC predecessors. The draw is smooth and perhaps not quite as airy as the larger Protank. Flavor production is fantastic and the coil assembly handles a wide range of voltages quite well. It is quite easy to produce massive amounts of vapor with the Mini. There is not much more to say about the Mini other than it is a faithful rendition of the Protank in a smaller, more eGo friendly package. Given the success of the latter, that should mean that is becomes another hit for Kanger. Note: A big thank you to Viper Vape for providing a Mini Protank for review. 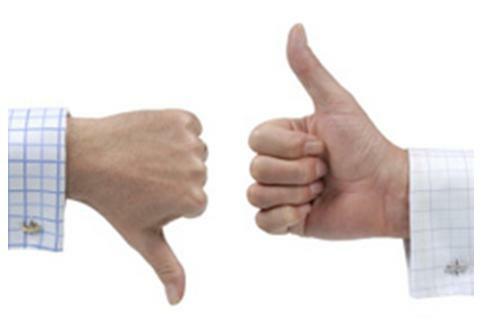 We appreciate the opportunity to try new vaping gear and as always try not to let that get in the way of an honest review. I wanted a pyrex tank as there are quite a few liquids that are said to crack tanks that I wanted to try. I use eGo batteries and did not want a big bulky tank. I did some research and decided to try the Mini. No regrets! It looks good, tastes good and is easy to fill and maintain!